2019 Kawasaki ZZR1400 Performance Sport. Picture credits - Kawasaki. Submit more pictures. The new ZZR1400 Performance Sport represents an intoxicating blend of engineering, style and performance. Already King of Hypersports, this machine comes equipped with a bespoke �hlins TTX rear shock absorber and Akrapovic lightweight titanium silencers plus wind cheating bubble screen. Front suspension: 43 mm inverted fork with top-out springs. Compression damping: 18-way. Rebound damping: 15-way. Spring preload: Fully adjustable. Front brakes: Double disc. Dual radial-mount, Brembo M50 monobloc, opposed 4-piston. Rear brakes: Single disc. Opposed, twin-piston caliper. Comments: Maximum power with RAM Air is 154.5 kW (210 PS) at 10,000 rpm. Small windscreen. Ask questions Join the 19 Kawasaki ZZR1400 Performance Sport discussion group or the general Kawasaki discussion group. Enter your e-mail to join the 2019 Kawasaki ZZR1400 Performance Sport forum and get notification of answers and new messages about this bike. You can unsubscribe with a single click. Bikez does not display, sell	or misuse e-mail addresses. Bikez.biz has an efficient motorcycle classifieds. Ads are free. Click here to sell a used 2019 Kawasaki ZZR1400 Performance Sport or advertise any other MC for sale. 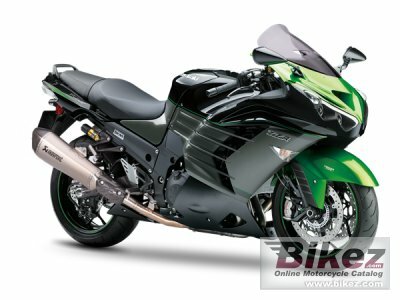 You can list all 2019 Kawasaki ZZR1400 Performance Sport available and also sign up for e-mail notification when such bikes are advertised in the future. Bikez has a high number of users looking for used bikes. Before you buy this bike, you should view the list of related motorbikes Compare technical specs. Look at photos. And check out the rating of the bike's engine performance, repair costs, etc.